Sendera Draft mare Reign of Stars at three days old. Our goal at the Sendera Draft Horse Registry is to work for a completely disease-free breed while increasing the gene pool and the genetic diversity available to our members. Working towards a disease-free breed means asking our members to have their horses tested for genetic disorders that we believe may be in the breed, as well as asking our breeders to follow certain steps to ensure that the disorders in question are removed from the gene pool. Beginning November 1, 2013, owners registering an Approved Cross were required to test their horses for a set of six genetic diseases as part of the registration process. Now, beginning January 1, 2015, all Sendera Draft Horses registering with the SDHR are required to complete that same panel of tests. Horses already registered with the SDHR are encouraged - but not required - to get tested to help with our efforts to produce the healthiest animals possible. Horses who register with the SDHR and test positive for one of these genetic diseases in Group 1 will be registered under Showing Only papers; they will not be allowed to produce SHDR-registered foals. Horses already registered with the SDHR who opt to test will not have their papers replaced; the disease will be noted on the papers, and any of their offspring who also test positive for the disease will be giving Showing Only papers. Any horse who tests positive for a genetic disease in Group 2, either newly registered or previously registered but newly tested, will have 2 generations in which to "breed out" these genetic disorders. This means that if you own Mare A, her foal Filly B can test positive for the same genetic disorder, but Filly B's foal Colt C cannot. If that second generation (post testing) foal also tests positive, the foal will be given Showing Only papers and will not be allowed to produce SDHR-registered foals. In all cases, horses who test positive for a genetic disorder cannot be bred to a horse that also tests positive for the same genetic disorder; foals from such a cross will also be given Showing Only papers and will not be allowed to produce SDHR-registered foals. The SDHR does acknowledge that there are other genetic disorders out there, and more are being discovered all the time; we've chosen to test for the ones that we believe are most likely to show up in the Sendera Draft based on the ancestry of the currently registered horses. Additional tests may be required, now and in the future, for horses we suspect might carry genetic disorders detrimental to the breed. It is the goal of the SDHR to work towards complete removal of all unwanted genetic conditions from the breed in a manner that punishes neither the horses nor the owners, while at the same time promoting ethical breeding practices and healthy horses. HERDA is primarily found in American Quarter Horses (generally those with the stallions Poco Bueno in their pedigree) and AQHA crosses, such as Paints and Appaloosas. Horses must have two copies of the gene that causes HERDA to display the effects of the gene, and often those effects will not appear until the horse starts saddle training. HERDA creates super-stretchy and extremely fragile skin, and the process of breaking a horse to saddle can cause tearing in the skin in affected horses. That tearing produces scarring and severe lesions and sores along the horse's back. Horses affected often must be euthanized, as the scarring and lesions can be quite painful. Currently, there is no cure for HERDA. Please bear in mind that there are other skin conditions that mimic HERDA; the only true way to tell if it is HERDA is a DNA test. If you suspect your horse is affected and you have not tested them yet, please work with your veterinarian to get a clear diagnosis. Since this disease comes from a very specific bloodline - that of AQHA stallion Poco Bueno, though recent research suggests that because his brother Old Grand Dad has also passed along the gene, their sire King P-234 may be the actual source - it is a simple genetic disease to eliminate from our breed. There are many other stallions within the AQHA with comparable breeding and prevalence; removing carriers from this stallion's lines should not unnecessarily impact most of our members. Not only that, but the SDHR feels that because the results of this disease are both catastrophic and often not discovered until maturity, we are not willing to take the chance that it will reappear generations down the line. HYPP is found primarily in American Quarter Horses and other related breeds (Paints, Appaloosas, etc) who trace direct descent from the AQHA stallion Impressive; in fact, this disease is sometimes known as 'Impressive Syndrome.' Affected horses will have random muscle twitching, episodes of paralysis, and unusual respiratory sounds; these events are sudden and unpredictable, and can range from minor enough to be unnoticeable to so severe that the horse collapses or dies. Autopsies on horses that die during one of these attacks typically show that the cause of death was respiratory failure or a heart attack. Symptoms can start at any age. Unlike HERDA, HYPP only requires a single copy of the gene for the symptoms to manifest; that means that no horse that tests positive for HYPP is ever truly unaffected. Like HERDA, the ties to a single bloodline make HYPP a fairly simple disease to eliminate from SDHR breeding stock; there are many comparable bloodlines, and many Impressive-lined stallions now list their HYPP status in stallion ads. We also feel that the risk of injury to humans during a paralysis attack and the risk of the sudden death of the affected horses, combined with the fact that all horses with positive test results are affected, mean that this is a disease that does not need to be spread within the SDHR under any circumstances. MH is primarily found in American Quarter Horses and related breeds, such as Paints and Appaloosas. Affected horses may not show signs of the disease until they are placed under anesthesia using certain drugs, or until they are placed in a situation of extreme stress or exercise. When the horse has an attack, the symptoms develop rapidly; fever, excessive sweating, a high heart rate, an abnormal heart rhythm, shallow breathing, and muscle rigidity are all common. If the horse is not treated quickly, death is likely. If a horse has both PSSM and MH, the symptoms of MH can be more severe. MH only requires a single copy of the gene for the symptoms to manifest; that means that no horse that tests positive for MH is ever truly unaffected. Similar to HERDA and HYPP, MH seems to be restricted to Quarter Horses and related breeds; while MH is not restricted to a single bloodline the way HERDA and HYPP is, it does seem to be very rare. Estimates in 2009 were that less than 1% of all Quarter Horses were affected by this disease. That makes it one of the easier genetic diseases to eliminate, simply because it is so rare. We also took into consideration the factors that any horse that has a copy of the gene is affected, that PSSM can make MH worse, and that this is a disease that can so very easily be fatal. Because the results of this disease are both catastrophic and often not discovered until maturity, the SDHR is not willing to take the chance that it will reappear generations down the line. The SDHR tests for PSSM1, which can be tested via genetic testing; we believe at this time that it is neither reasonable for our members nor kind to our horses to require everyone to test for PSSM2, as that test can only be done via muscle biopsy and can easily produce false positives. PSSM affects how horses process starches and sugars in their diet, which in turn affects how their muscles function. Horses with PSSM will have episodes of what looks like tying-up - muscle stiffness and pain, sweating, reluctance to move, and skin twitching are the most common, but weakness, gait abnormalities, mild colic, and muscle wasting may also occur. If a horse has a particularly severe attack, they may be unable to stand and appear uncomfortable even when lying down. After an episode, the affected horse may urinate or appear to need to; in severe cases, the urine can be quite dark. The frequency of these attacks vary widely by horse, depending on their diet and exercise regime. Horses kept on a low-starch, low-sugar diet may never exhibit symptoms. PSSM only requires a single copy of the gene for the symptoms to manifest; that means that no horse that tests positive for PSSM can be considered unaffected. PSSM can be found in a wide variety of breeds, including Quarter Horses (and closely related breeds like Paints and Appaloosas), Morgans, and draft breeds that originated in continental Europe (such as Belgians and Percherons). In fact, 60-80% of draft horses test positive for PSSM1. Please bear in mind that there are other muscle conditions that mimic PSSM; the only true way to tell if it is PSSM is testing - genetic testing for PSSM1 or a muscle biopsy for PSSM2. If you suspect your horse is affected and you have not tested them yet, please work with your veterinarian to get a clear diagnosis. In the case of PSSM, we are presented with an unusual problem. As noted above, 60-80% of draft horses test positive for PSSM1, and the affected breeds include breeds originally used to create the Sendera Draft Horse. That makes it difficult to avoid without changing how the breed looks. Refusing registration to all horses that test positive for PSSM would leave us with an unworkably small potential breeding population and would force us to remove some currently-registered horses from the breed; harshly restricting the offspring of currently registered horses with PSSM would undo more than six years of work to grow the breed. Neither are acceptable options. The ability to manage the symptoms with a low-starch, low-sugar diet also played a part in our decision to make PSSM one of the diseases that owners will be able to breed out. GBED is found primarily in American Quarter Horses and other related breeds (primarily Paints, but Appaloosas and others might be affected) who trace direct descent from the AQHA stallion Zantanon and his son, King P-234. (Interestingly, King P-234 is also the sire of Poco Bueno, the suspected source of HERDA.) The original study on GBED estimated that 8-10% of the descendants of King P-234 were carriers of GBED, and GBED may be responsible of up to 3% of abortions across the Quarter Horse population. The disease affects how a horse converts sugars to energy and stores that energy; too little stored energy makes it difficult to fuel the muscles and brain. Two copies of GBED is consistently fatal. Many of these foals are aborted or stillborn. 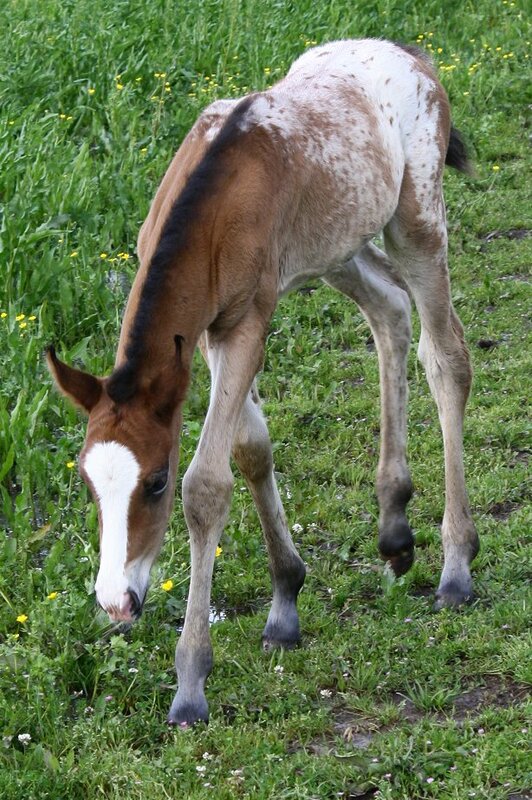 Foals born alive do not live longer than 18 weeks, and many of them don't make it to 8 weeks of age. The living foals have low energy, weakness, difficulty standing or breathing, low body temperature, contracted muscles or tendons, and seizures. They may die suddenly while exercising - for instance, while running in the pasture - or may have to be euthanized due to general weakness. Horses must have two copies of the gene that causes GBED to display the effects of the gene. Please bear in mind that there are other diseases and conditions in foals that may look like GBED, simply because it looks like weakness; the only true way to tell if it is GBED is lab testing (either DNA testing or a muscle biopsy). If you suspect your horse is affected and you have not tested the foal yet, please work with your veterinarian to get a clear diagnosis. Unlike the other diseases tightly tied to individual bloodlines (HYPP and HERDA), we are not outright banning GBED; the carriers are healthy, and preventing an affected foal is easy with mandatory genetic testing. It is a heartbreaking disease for breeders, but one that cannot be passed on 100% of the time simply because the horses with two copies of the gene die so quickly. That makes it something that can easily be removed from the breed over time. There are two types of JEB: JEB1 and JEB2. JEB1 is primarily found in Belgian draft horses and related breeds (such as the American Cream Draft), but has also been reported in French draft breeds (such as the Breton, Comtois, Vlaams Paard, and Belgische Koubloed Flander). It is estimated that 15-20% of Belgians carry JEB1, but that number is decreasing in the United States due to intense efforts by the American registries. JEB2 is primarily found in American Saddlebred horses. Approximately 4% of American Saddlebreds are estimated to carry JEB2. In both forms, JEB affects the body's ability to hold the skin and hooves onto the rest of the body. Affected foals have sores and lesions that grow quickly from just pressure points to large patches across the body, ulcers in the mouth, and loss of the hoof wall - or even the entire hoof. They may also be born with front teeth, something not normally seen in foals until they are eight days old. Foals affected by JEB typically only live for 3-8 days; infections from the sores are common and often lethal, but the foals are sometimes euthanized simply because it is inhumane to allow an animal in such pain to continue to live. Horses must have two copies of the gene that causes JEB to display the effects of the gene. Please bear in mind that there are other diseases and conditions in foals that may look like the initial stages of JEB; the only true way to know if it is JEB is genetic testing of the sire and dam. If you suspect your horse is affected, please work with your veterinarian to get a clear diagnosis. As with PSSM, the breeds affected by JEB1 form an important part of the foundation of our breed, and avoiding them outright could easily result in a shift of conformation and type, drastically changing the breed we are working so hard to maintain. The American Belgian Draft Horse registry is also working to get all breeding horses tested for JEB1, something that will make it easier in the future to choose animals with out the disease - but only within the Belgian breed. It is a heartbreaking disease for breeders, but one that cannot be passed on 100% of the time simply because the horses with two copies of the gene die so quickly. Horses with one copy of the gene do not seem to be affected at all. That makes it something that can easily be removed from the breed over time.